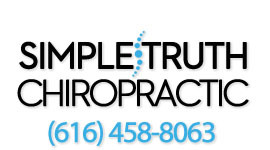 When you enter Simple Truth Chiropractic, our front desk receptionist will great you with a friendly smile and welcome you into our practice. You can choose from water, coffee or tea while you fill out your paperwork and wait to be seen by the doctor. You can also take the time to fill out the online forms by downloading them here or under the new patient center. This will make your visit much faster and more efficient and save you time. Next, you will have a consultation with either Dr. Alexander LeBon or Dr. Daniel DeBiasio for a consultation of your primary problems and concerns. This initial portion of this visit is not to treat you, but to listen to you, learn more about your problem or condition and to find out if you are a good chiropractic candidate. After your consultation, our Grand Rapids chiropractors will then examine you by doing a baseline range of motion test, orthopedic exams, neurological exams and a complete chiropractic exam. These tests are to determine if there is dysfunction that may be causing your problem. The doctor may perform other tests specific to your condition that will give them more information to move them towards a decision of whether or not you're a good candidate for chiropractic care and whether or not they can help you. Depending on what the doctor finds, they may or may not take x-rays. X-rays are taken completely dependent on your condition and whether or not the doctor finds them necessary to make the proper decision regarding your healthcare needs. What we've found is that most people find it amazing to see their x-rays and have them explained in such a high level of detail. With X-rays, they can help rule in and rule out serious conditions as well as levels of degeneration and misalignment. If you can, how long will it take? The report of findings is a great place to bring a spouse, close family member, or someone that cares about your health and well being. It's very difficult to remember everything that was said, and two heads are often better than one. It also helps for your support system to know what you're going through. Based on years of experience, you will only hear the truth from our doctors. If they can help you, they will tell you, but if not, they will tell you that too. After you have finished with your report of findings and gone over the financial aspect of care, you will get your first chiropractic adjustment and possibly other treatment. The chiropractic adjustment is where all the magic happens in our practice. Our chiropractors understand the hesitation and anxiety it comes to getting your first chiropractic adjustment. We have a no stress, very open environment where you can discuss your treatment, what is going to happen and what to do after your first chiropractic adjustment. During the course of care, the doctor may suggest specific things to do while you are being treated with chiropractic. Some of these things include ice and/or heat. This is especially true if you show up to our office with a sprain, strain or an acute injury. Our doctors may also recommend specific nutritional supplements to support your care and/or specific exercises to help build your core and your posture during the course of treatment.